Firstly, I must apologise readers for being such a bad blogger recently. Work has been super busy with deadlines and sadly, Skin Deep has had to take a back seat but I'm so thankful for your continued support. 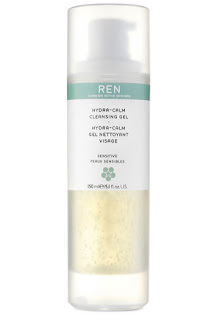 I'm currently loving REN Skincare and have recently been using the Hydra Calm Cleansing Gel. As with all REN products, the packaging is sleek and reiterates the clean and pure branding. I like that it's functional, with a pump dispenser and transparent so that you can see how much product is remaining. As a cleansing gel, it's practically foolproof to use and for me, this makes it ideal for use as an in-shower facial wash in the mornings. I also really like the delicate orange blossom scent. I'd recommend this to anyone, particularly those with sensitive skin. My skin was left feeling clean but not stripped or tight. At £17 for 150ml, it's not exactly a budget option but a little goes a long way and I do feel that the price reflects the quality.